Smoggy days are often blamed on regional pollution and weather, but at least one recent scientific study has shown that the city can, under the right conditions, “form its own smog”. The study by Hong Kong and Macau air scientists argued that a rapid build-up of particulate matter in the air – a key component of smog – was possible even in the absence of northerly winds that can transport pollutants from afar. The evidence boiled down to at least one particular sunny September day in Hong Kong in which a “land-sea breeze” pattern formed along with weak winds far below average speeds. The scientists observed a rapid rise of photochemical activity during mid-afternoon, in which ozone and nitrogen dioxide skyrocketed along with increasing sunshine. “It is clear that there was a rapid increase in particulate matter (PM) concentration on this day when we were not really affected by external meteorological conditions. It’s not easy to argue in this case that winds were blowing PM to Hong Kong from the region ,” said co-author Professor Chan Chak-keung, dean of City University’s school of energy and environment. The culprits, he said, were most likely local sources such as vehicles or industrial emissions, which contain nitrogen oxides and volatile organic compounds. The latter pollutant is also found in products such as organic solvents, paints and printer inks. Chan’s team investigated “episodes” – days with high PM concentrations – in one-month periods in each of the four seasons from 2011 to 2012 at the University of Science and Technology’s air quality research supersite. Other episodes across the seasons were also observed with high local photochemical activity, but those days also came under the influence of transported air from the north, making it less clear what was actually local or regional. The paper was published in scientific journal Atmospheric Chemistry and Physics in November. Photochemical smog is created when nitrogen oxides react with volatile organic compounds in the air under sunlight. It leads to the formation of ozone. This hazardous pollutant facilitates the formation of the tiny particles, small enough to be inhaled deep into the lungs and even into the bloodstream. The particulate matter in the air lowers visibility, turning the sky smoggy and gives it a lurid orange tint at dusk. The Environmental Protection Department usually points to meteorological influences such as northeast monsoons when the air quality health index hits “very high” health risk levels. It added that the formation of ozone and fine particulates during the daytime resulted in high pollution in the region. Chan said most smoggy days were doubtless a result of regional factors or pollution. But he said the study’s findings warranted more research on how PM was formed and pinpointing its sources. Exposure to air pollution increases the risk of contracting cancers and heart, lung and respiratory diseases. According to the latest available estimates by the World Health Organization (WHO), 5.5 million premature deaths worldwide, or 1 in every 10 deaths, in 2013 were attributable to indoor and outdoor air pollution. A joint study, entitled “The Cost of Air Pollution: Strengthening the economic case for action”, published by the World Bank and the Institute for Health Metrics and Evaluation, has estimated the costs of premature deaths related to air pollution. Using the WHO estimates of premature mortality attributable to air pollution, the study valued the economic costs following two different approaches: Firstly a welfare-based approach that monetizes the increased fatality risk from air pollution according to individuals’ willingness to pay, and secondly an income-based approach that equates the financial cost of premature mortality with the present value of forgone lifetime earnings. In 2013, the cost to the world’s economy of welfare losses due to exposure to ambient and household air pollution amounted to some US$5.11 trillion. In terms of magnitude, welfare losses in South Asia and East Asia and the Pacific were the equivalent of about 7.5 per cent of the regional gross domestic product (GDP), while in Europe and North America they were equal to respectively 5.1 and 2.8 per cent of GDP. At the low end, losses were still equal to 2.2 per cent of GDP in the Middle East and North Africa. It is pointed out that the full costs of air pollution to society are even greater than is reported in the study. Examples of other costs not included in this report are the costs of illnesses (e.g. hospital care, medication), reduced output of agricultural crops, damage to natural ecosystems and cultural heritage, and lowered economic competitiveness of growing cities. On top of being a major health risk, air pollution is also a drag on development. By causing illness and premature death, air pollution reduces the quality of life. By causing a loss of productive labour, it also reduces productivity and incomes. According to the study, annual labour income losses cost the equivalent of 0.83 per cent of the gross domestic product (GDP) in South Asia. In East Asia and the Pacific, where the population is ageing, labour income losses represent 0.25 per cent of GDP, while in Sub-Saharan Africa, where air pollution impairs the earning potential of younger populations, annual labour income losses represent 0.61 per cent of GDP. When Alexander Hjertstrom moved from his native Sweden to the western Indian city of Ahmedabad in the autumn of 2014, he suffered the return of an old fiend: asthma. The intense air pollution in the city had caused his long-gone respiratory condition to return. Hjertstrom, then a master’s student on a six-month exchange at the Indian Institute of Management, found that wearing an anti-pollution breathing mask was the most effective way to protect himself. However, he found most masks on the market were primitive and far from perfect in design and construction. They were certainly not appealing to wear every day. Upon his return to Sweden after finishing a research project on air pollution while in India, Hjertstrom discussed the problem with three friends. Living in Sweden, the clean Scandinavian air was something all four had taken for granted. “Given how acute the problem of air pollution was and the poor product offerings we could find, we decided to do something about it,” says Fredrik Kempe, a childhood friend of Hjertstrom. 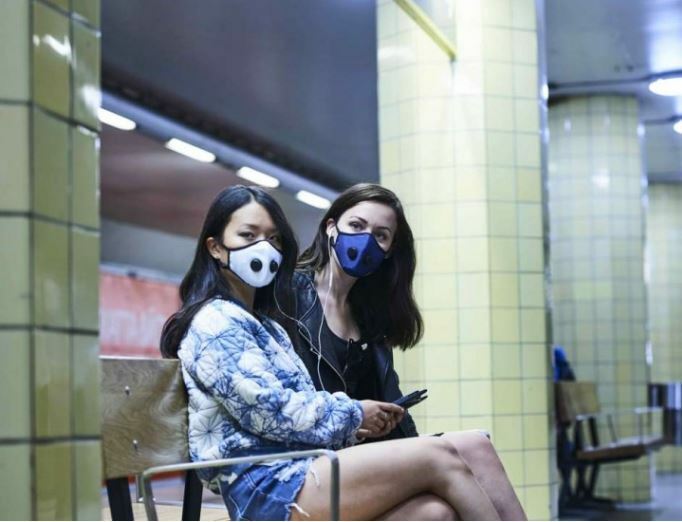 They came up with the Airinum Urban Breathing Mask, which its founders term a “next generation anti-pollution mask”. In tests it has been shown to protect wearers up to six times better than other widely available masks. After months of development, a very successful Kickstarter crowdfunding campaign and large number of pre-orders, the company opened their online shop for worldwide sales on December 1. “Compared to all other civilian masks that we’ve found, purchased and tested, our mask really works,” says Kempe, Airinum’s co-founder and chief marketing officer, who has a master’s degree in innovation management. Anti-pollution masks are big business, particularly in smoggy China, where face masks even feature on fashion show catwalks. Sales of masks in China reached 1.7 billion units in 2014, a 20 per cent increase year on year, according to Chinese market research firm Daxue Consulting. Airinum looks similar to other high-end masks on the market, such as Vogmask, currently the leading face mask in China, and Cambridge Mask. But Kempe says Airinum’s Urban Breathing Mask is “completely different”. For one thing it has a unique changeable filter system, while Vogmask’s filter is permanently sewn into the mask and does not have reusable exhalation valves. So once Vogmask’s filter reaches the end of its useful life (hundreds of hours), or starts to leak, a new mask has to be bought. Airinum’s mask has proprietary changeable filters that use a three-layer, hi-tech filter technology which protects against up to 99 per cent of viruses, bacteria, allergens and smog. External tests have shown the mask to have better filtration efficiency than the N95 filter mask requirements set forth by the US National Institute for Occupational Safety and Health. For easy breathing, the mask has two custom-made exhalation valves – essential to let warm, moist air out of the mask. For the perfect fit, the mask uses stretchable material that fits the contours of the wearer’s face. Adjustable ear loops and an elastic binding surrounding the mask ensure a tight seal around the face. The mask comes in five sizes to suit both children and adults. For some aesthetic flair, the founders sought the expertise of renowned Scandinavian creative minds – Mattias Wiklund, the menswear pattern maker at Swedish fast fashion chain H&M, and Kemal Alidzikovic, who works with Swedish fashion/function brands such as Acne and Haglofs. The Kickstarter campaign, which ran for five weeks in November and December 2015, gathered up €70,743 (HK$581,522) from 1,386 backers in more than 30 markets, including Hong Kong. Airinum also received funding from the Swedish government, business angels and an accelerator programme in Stockholm. The Urban Breathing Mask costs US$75 and the price includes the mask and two filters, which last up to 200 hours. The company plans to offer a long-term subscription service for filters.